In a month, August 20 and 21, the leaders of the United States, Canada, and Mexico will sit down together in Montebello, Quebec to discuss making the borders between these three nations disappear. They will discuss progress on a vast highway project passing through America to link Mexico with Canada. So far, no one has asked the citizens of these three nations whether they want to do this. It is not up for a vote in Congress and, indeed, Congress has no supervision over the gnomes in the U.S. Department of Commerce who are busily "harmonizing" the laws under the auspices of the Security and Prosperity Partnership of North America (SPP). This, we're told, is not a treaty so Congress has no constitutional oversight obligation. I guess it's more like a nice big handshake between the leaders of these three nations who, let's face it, just know better than the rest of us. I mean, do Canadians really think they're in charge of Canada? Americans should have a say about programs affecting America? Or has anyone asked Mexicans if they want to be part of some "harmonized" configuration not unlike the European Union? Last time I checked, the European Union lacked a constitution because some of its member states, notably France, had rejected the one that was offered. The Constitutions of the United States, Canada and Mexico are about three sovereign states determining their own regulations and laws. So far, fourteen U.S. States have passed resolutions in their respective and sovereign legislatures directing the federal government to abandon further activities involving SPP. Part of the opposition is directed at what is generally called the NAFTA Superhighway; an exceptionally wide corridor that would include rail lines, freeways, and pipelines from Mexico to the Canadian border. The Texas legislature passed a law intended to slow down the highway project with a two-year moratorium. The vote in the Texas House was 137-2. The Texas Senate passed it with only four votes in opposition, but the Governor vetoed it in late June, thus opening the door to the seizure of the private property needed for the Trans Texas Corridor (TCC). Turns out that Texas had already signed a 50-year lease with a private Spanish company named Cintra, one that permits for no competition by way of building new government roads or improving existing ones going in the same direction. 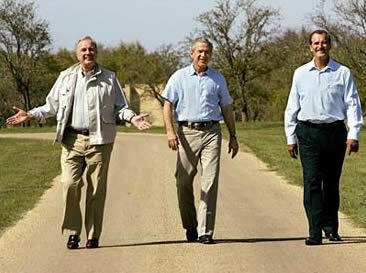 Why are we not surprised to know that SPP was kicked off in 2005 by a meeting in Crawford, Texas of the then-presidents of the three nations hosted by President George W. Bush, a former Governor of Texas? Bush has been a leading proponent of the "immigration reform" legislation that more than two-thirds of Americans polled say they do not want. Tucked into those "reforms" were provisions to advance SPP. A Teddy Kennedy amendment to S. 1348 asserts that, "It is the sense of the Congress that the United States and Mexico should accelerate the implementation of the Partnership for Prosperity to help generate economic growth and improve the standard of living in Mexico, which will lead to reduced immigration." Oh, yeah? And here I thought the economic well being of Mexico was the job of the Mexican government. As this is written, the President and the Congress have the lowest popularity ratings ever. Perhaps it has something to do with a secretive process involving the highest levels of government and a consortium of multinational corporations who are eager for the nation-busting North American Union and the superhighway? Indeed, "secretive" is the mode of operation for SPP from the beginning. Last year, from September 12 to 14, a gathering sponsored by something called the North American Forum, brought together some very powerful people, but the media was not informed about it, nor has a list of attendees been available. One Canadian commentator has written that, "There is no better indication that these meetings and the SPP itself, constitute a parallel governing structure—unaccountable to any democratic institution or the public." This is not the way America, Canada, and presumably, Mexico, is supposed to be governed. The public outcry against the proposed immigration reform bill was enough to kill it in its present form. In his book, The Late Great U.S.A. ($25.95, WND Books), Jerome R. Corsi, Ph.D., warns that, "There are movements afoot in Mexico, Canada, and the United States, similar to those in Europe that led to the formation of the European Union that, if left unchecked, will erode U.S. sovereignty and lead to a North American Union." Perhaps when Congress begins to raise our taxes, authorize a superhighway, and offer yet another amnesty to millions of illegal aliens, the American people may take notice and want to do something about it. By then, however, it may be too late. That's what President Bush is counting on. Meanwhile, he has a big calendar counting down the days to January 20, 2008 when he can start cashing in on having sold out the rest of us.